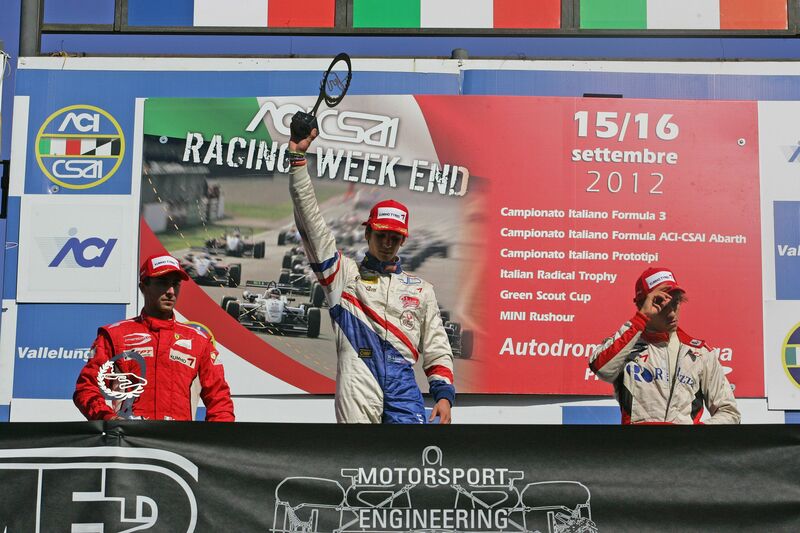 15/09/2012 - One name only on top of the charts of Vallelunga: Riccardo Agostini. The driver from Padova racing for JD Motorsport secured both pole positions this morning and then put his mark on the first race of the weekend, managing the race from the pole all the way to the flag. He also made his the satisfaction of setting the fastest lap of the race and the driver from Padova harvested 23 points in the Saturday on the Mygale belonging to the team of Vespolate. The second position went to Brandon Maisano. The French pupil of Ferrari Driver Academy, in force at Prema Powerteam has been good to take his team mate Eddie Cheever at the start as the latter could not do anything but getting his slipstream and attempting a move two laps afterwards. The overtaking did not succeed as Maisano closed the door to the Roman, keeping the second place. Fourth was Kevin Giovesi, who keeps on collecting results and points that took him to the fourth place of the Italian championship. The Milanese driving for Team Ghinzani will start from the second spot of the grid tomorrow, ahead of the Prema Powerteam pairing and on the side of Agostini in front row. Fifth place for Henrique Martins (Prema Powerteam) who fought for half race with Nicholas Latifi (JD MOtorsport) and Sergey Sirotkin (Euronova). Sirotkin did not have enough luck though as the Moscow driver had to give away the fifth position due to a problem to the fuel pump while the Canadian of JD Motorsport inherited the sixth position which is also worth the pole position of race 3. The seventh place went to Robert Visoiu (Ghinzani) who was at his comeback and defended his place well from the moves of the driver from Latina in force at team BVM, Mario Marasca. Ninth place for the rookie Michael Heche, BVM' second driver at Vallelunga. Bad luck also for the other Euronova driver, Yoshitaka Kuroda. The Japanese had to stop during lap six due to an engine problem. Two races not to be missed are scheduled for tomorrow. At 10.00 (GMT+2) live coverage on Rai Sport 2 and web streaming at www.acisportitalia.it/F3 of the longest race of the weekend (30' plus a lap). The exit near Rome of the Formula 3 will end at 16.00 with the Sprint race (15' plus a lap).